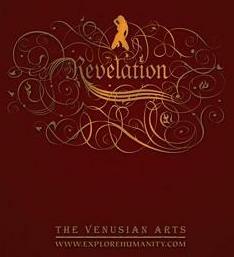 Earlier this summer Venusian Arts released a new product called “Revelation“. They have just finished the latest version of Revelation and it contains several corrections from the previous version. I contacted Venusian Arts and was able to get them to send me a review copy of the ebook part of the product for evaluation. What does Revelation consist of? Immediately after buying Revelation, you will be able to download the Revelation ebook. It is by far the largest ebook I have ever downloaded in regards to size. It is just over 300 pages and is professionally put together. Within two weeks of ordering you will receive eight DVDs covering the best parts of the Revelation Seminars. These seminars include Mystery, Matador and Lovedrop speaking. Along with the above mentioned DVDs, you will also get 13 CDs called “Inside Mystery’s Brain”. Who is involved in Revelation? Revelation is put out by Venusian Arts. The visible heads of Venusian Arts are Mystery, Lovedrop and James “Matador”. The Revelation ebook is written by Lovedrop with contributions from Mystery and Matador. In comparison, the Venusian Arts Handbook was co-written by Lovedrop and Mystery. The audio and video components contain Mystery, Lovedrop and Matador. So Mystery + Matador + Lovedrop = Venusian Arts and Venusian Arts only endorses Revelation at this time. This product is what you are going to want to get if you want to learn what Mystery from the VH1 show “The Pickup Artist” is currently teaching. The ebook weighs in at 12 chapters and just over 300 pages. There are some pictures but not an excessive amount. The text is not crammed onto each page. The design of the book involves a rustic aged paper look. Each page is black text on a brownish tan background. On the edge of each page is the silhouette of what looks like a bean plant. You can click here to see example pages. There are pictures and diagrams throughout the book and they are colorful and vibrant. Overall I like the look of the ebook. Who cares about the look? What about the content! Basically they took the classic Mystery material circa 2004-2005 and evolved, tweaked and modernized it for the state of things in 2008. This means this book is a hell of a lot like the Venusian Arts Handbook yet a hell of a lot different too. A lot of Mystery’s core teachings are still there. For example, the book starts out with the classic evolutionary backdrop that we have heard a million times before. Survival and replication value anyone? You will still find information on disqualifiers, IOIs, opening, hooking, isolating, etc. The book seems to throw away the highly structuralized M3 model of the past. In fact, the book only covers the actual pickup itself. The chapters and material are more traditionally ordered and structured. The book also tries to steer past and underemphasize the classic Mystery components that have since gotten negative press such as peacocking, negging and the use of canned material. With the elimination or less emphasis of those negative components, they have introduced new components and additional emphasis on microcalibration, vibe, delivery, value, group theory and inner and outer game. I’m a huge fan of both Mystery and Lovedrop and think this book it great and recommend it. I think it addresses many of the changes that have come out in the community since the Project Hollywood days. I do not like that they caved in and lowered the emphasis on peacocking, negging and canned material. I think all three of these are very important and any negative connotations surrounding them is due to misunderstanding or competing company propaganda. People have been giving Mehow the nickname “Mystery 2.0″. Basically Mehow was a student of Mystery’s before becoming an instructor for him. Later he left and started his own company. He taught a lot of the components of the traditional Mystery Method but supplemented them with his own new and expanded theories. The addition of microcalibration, value and group theory in this new book sure mimic those supplemented and expanded theories that Mehow has been talking about and teaching in the past year. I guess what goes around comes around! The glaring weakness of this review is that I do not have the DVDs and CDs. As a rule of thumb, I can say that I’m a fan of Mystery, Matador and Lovedrop in regards to their speaking ability. The ebook alone is $97 and the ebook, DVDs and CDs cost $497. Some may consider this pricey and that is all subjective. I thought it was quite standard for the amount of material involved. Mystery is basically the most notable, distinguishable, in-demand and marketable guru there is so one can only expect to pay a premium for anything with his name associated with it. To be honest, I find the price to be quite comparable to similar products by lesser known gurus. As previously noted, I have not gotten a review copy of the DVDs and CDs and those are probably the biggest components in determining if this product is ultimately worth the money. There is a lot of drama surrounding Mystery. Some of it is simply propaganda and some of it is of merit. The truth is that drama follows those who are on top. Mystery is on top. Maybe he is not as prolific as he once was or as continually innovative. The fact is that his ideas and concepts are the real deal and work. I find that Mystery, Matador and Lovedrop are all very good speakers. I enjoy listening to them speak and find them captivating. They try to say that a Mystery bootcamp or seminar would cost several thousand dollars so $500 for this product is a steal. I find such selling analogies to be cliche overall, yet I can see their point in regards to Mystery.